WWF-Cymru, the Welsh arm of the global conservation organisation, is celebrating the 10th anniversary of Earth Hour (the annual event that sees millions worldwide switch off their lights) this March, by helping the people of Wales to send a giant, eight metre message in a bottle to Welsh politicians and the world, calling for urgent national and global action on climate change. Suspended from the Senedd building in the week running up to Earth Hour (March 25th, 8.30pm – 9.30pm) the installation, designed by artist Lulu Quinn, will symbolise the hundreds of messages gathered from across Wales online and face-to-face. “Sustainability features prominently within the National Assembly for Wales – both within the context of policy work undertaken by Committees scrutinising Government but also that the very building in which this work is carried out represents a practical expression of the Assembly’s commitment to sustainability. 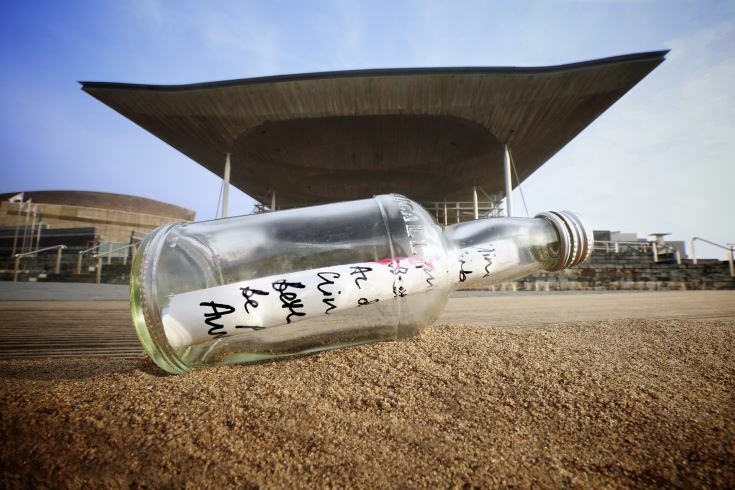 WWF-Cymru has based its campaign on the age old, romantic practice, of sending a message in a bottle, which inspires action on the part of the person who finds the bottle to learn more about the sender and their wishes. WWF-Cymru wants Welsh politicians – who will receive this message – to be similarly energised, stirring within them a deep commitment to take urgent action on climate change. Global temperatures have been rising for over a century, speeding up in recent years, and are now at their highest. 2016 was the hottest year on record, beating the previous two records of 2015 and 2014. Worldwide, we’re experiencing record floods, droughts, superstorms and wildfires. Nearly one in six species are at risk from extinction due to climate change. In Wales, the communities we call home and our incredible nature are also at risk. Support for Earth Hour has grown each year – with a record 178 countries taking part in 2016 – and 2017’s is set to be the biggest yet. Last year, an estimated half a million people across Wales took part. In 2017, many iconic landmarks have already pledged to turn their lights out on the night – from Caernarfon Castle to Cardiff’s Principality Stadium. Over half of all Welsh local authorities have already signed up, along with 286 schools throughout the country.